Greenwich Village Stories is a lovely new book from the folks at the Greenwich Village Society for Historic Preservation. It’s filled with reminiscences from dozens of former and current residents—from artists to activists to politicians—who give their take on the beauty and spirit of the neighborhood. It’s an evocative read that also captures how much the Village has changed over the years. 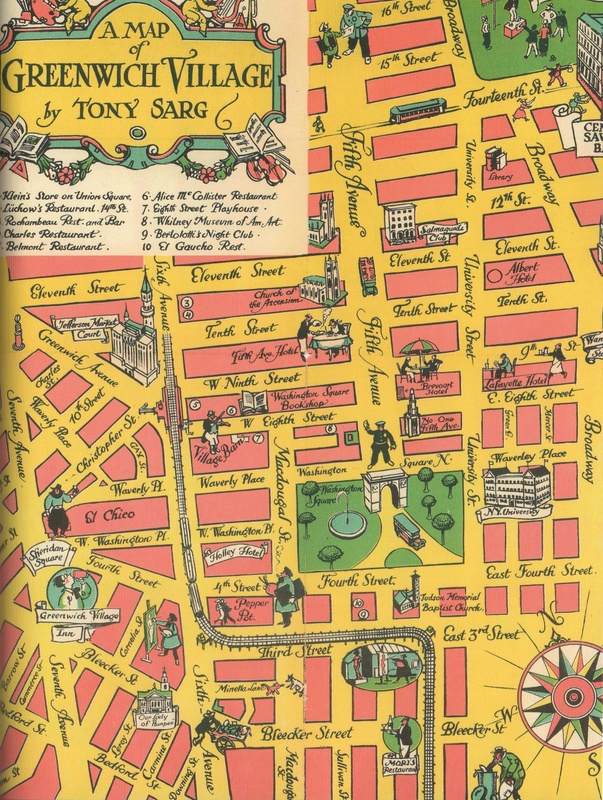 Driving that point home is a wonderful map of Greenwich Village circa 1934 by puppeteer and illustrator Tony Sarg that has been reproduced in the book. While the street grid is the same, the landmarks Sarg depicts with such affection don’t always exist anymore. Jefferson Market prison, the Washington Square Bookshop, the Village Barn, Luchow’s, and Wanamaker’s department store are all long gone. Various hotels marked on the map are now apartment houses: the Albert, the Brevoort, the Lafayette. New York University, interestingly, barely gets a mention—the main campus in the 1930s was in the Bronx. This entry was posted on May 12, 2014 at 6:56 am and is filed under Bars and restaurants, Maps, West Village. You can follow any responses to this entry through the RSS 2.0 feed. You can leave a response, or trackback from your own site. Interestingly, this map shows vehicular traffic in Washington Square on a road under the arch. In a recent ENY post discussing Robert Moses, it said that his proposals to build either a surface road through the square, or a tunnel, were wisely successfully opposed. Was there actually a road through the square at the time the map was drawn? Vehicles were allowed through the Washington Square arch until 1958. I think Moses’ plans were to widen the vehicular roadway through the park to accommodate the increase in traffic in the area, while neighborhood residents successfully fought to close it off to all traffic instead. When did University Street become University Place? Or is that a mistake? “East Fourth Street” and “East 3rd Street” are labeled west of Broadway. Is this also a mistake, or did the division between the east and west sides shift to Broadway later? Right, traffic was permitted through the park, but Moses wanted to build a pretty substantial roadway, more like a highway. Good eye Tacony. I’m chalking it up to the illustrator’s whimsy. I’d never heard that east was once west! I’m not sure what Luchow’s was like in 1934, but when I went in 1978 on a trip to New York with the theatre department from University of Kansas let’s just say it was past it’s prime. As a former native I visited Luchow,s many times up until the late 1970s. I remember taking my elderly mother for a visit and we enjoyed it very much. I don,t recall when it closed but it was always a pleasant experience.